Are sluggish, error-prone processes costing your company customers and profits? Do you want to make your company more productive and profitable? 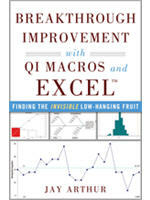 Breakthrough Improvement with QI Macros and Excel offers a streamlined and simple way to learn this revolutionary improvement method and tools. Lean Six Sigma Demystified offers a streamlined and simple way to learn these revolutionary quality improvement method and tools. Lean Six Sigma Demystified covers the essential methods and tools that you need to start reducing delay, defects and deviation immediately. 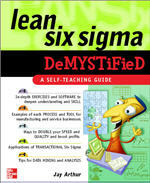 More about "Lean Six Sigma Demystified"
Are sluggish, error-prone processes costing your patients time and money? Want to make your hospital more productive and profitable? Lean Six Sigma for Hospitals offers a streamlined and simple way to learn this revolutionary quality improvement method and tools. More about "Lean Six Sigma for Hospitals"
Don't get lost in the formulas. Learn how to use and interpret SPC charts to analyze and improve your processes and products. This book contains detailed examples and step-by-step instructions. More about "SPC Simplified Book"